Christmas in the Castle Gift Shop .. Presents diverse vendor booths in every category imaginable, craft activities, Santa visit and other holiday favorite characters, Sunday, December 16th from 12pm to 4pm in the Great Hall at the John W Higgins Armory Event Center! Tone-deaf Tuesdays at Electric Haze, 26 Millbury Street, Worcester. Every Tuesday Poison ‘N Envy hosts Worcester’s wildest karaoke night at Electric Haze. 6PM-2AM No Cover 21+ ID Required Games, Cash prizes, and more! Come get weird Worcester! 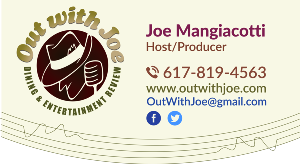 Time now to check on what is hot and happening on the local music scene with Music Editor Tina Marie Billing check and follow us on social media at out with Joe.